I am now an honest to gawd professional photographer. I’ve been published before but this time somebody has written a check… well, in theory at least. Go download this month’s issue of Winding Road. You can find it here. It is a great magazine with excellent writing and fantastic photography. I’m honored to be chosen and included. They have two of my images in their current issue. 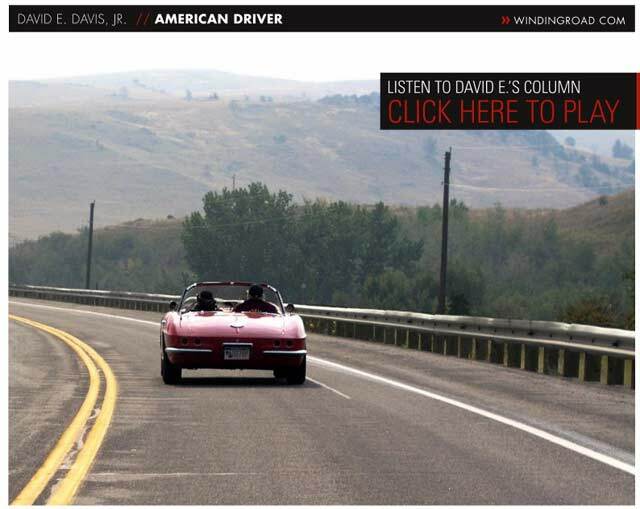 The first is found on page 18, in David E. Davis’ editorial column “American Driver.” It is of his Corvette, taken on the second day of the 2006 Going To The Sun Rally. The images are so washed out because the summer of 2006 was a really bad one for forest fires in the west and the air was basically a blanket of smoke. Makes for grainy and flat photos. Oh well. Author chuck goolsbeePosted on January 23, 2008 January 23, 2008 Categories 06 GTTSR, Car Photo Of The Day, Cars5 Comments on Published! I’m suffering from Separation Anxiety this week. The 65E is at a body shop, getting that damage to the bonnet you see above fixed. It happened last autumn, when I removed the Going to the Sun Rally sticker from the car. A fist-sized chunk of clear coat came of with the sticker and I went suicidal for several days. I’ve gotten over the suicidal tendencies but I do worry whenever the car is at a shop I don’t know well. If you recall I was very disappointed in the last body/paint job I had done to the car. Insurance isn’t involved this time, so maybe it will work out. This shop came highly recommended by several local “car guys” around Arlington. It should be done later this week. Next up is rebuilding the steering rack, and then the summer rally & slalom season starts! Though I don’t put a lot of stock in superstition, I am usually a very lucky guy. Life has rarely dealt me any serious whacks. Today however, is Friday the 13th. Something I didn’t even think about really… except perhaps when I updated the voicemail message on my work phone. 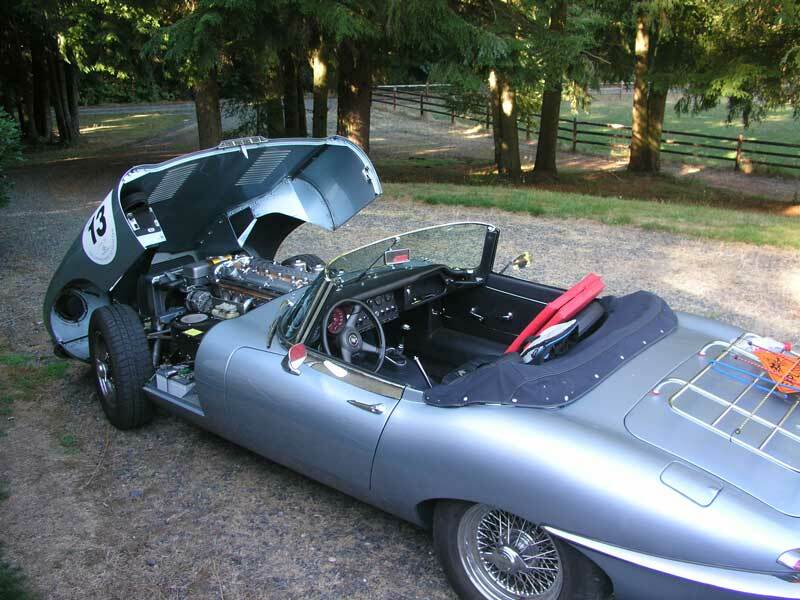 So I’m working from home today and at lunchtime I head out to the barn and prep the 65E for a weekend Jaguar club event. 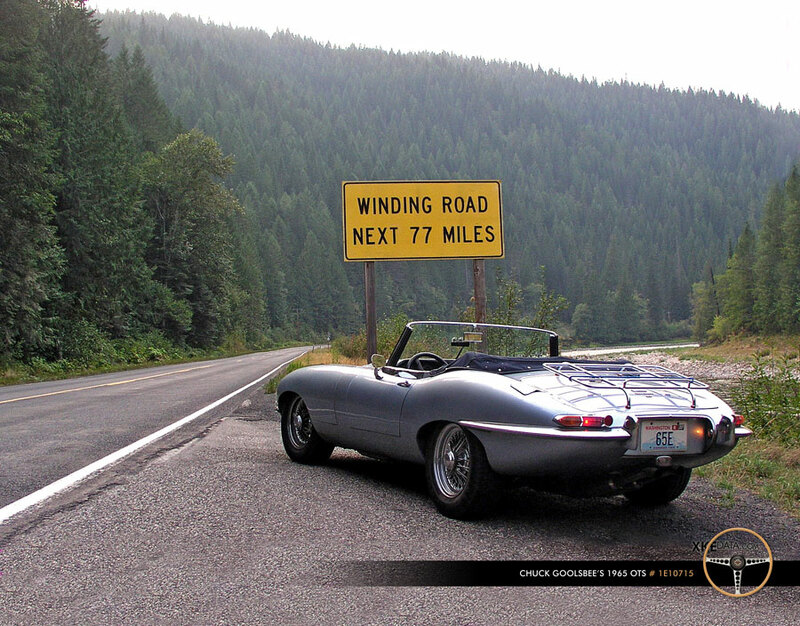 The Seattle Jaguar Club is having their “Fall Colors Tour” tomorrow and I haven’t even looked at the E-type since the Going to the Sun Rally finished up last month. I took it out once for a brief drive since then… mostly because the weather has been crappy most weekends since I came back… or I’ve just been too busy. So I push the Jaguar out of the barn and get ready to wash it. The car number stickers from the Montana Rally are still on the car so I decide to take them off. The first one comes off pretty easily… after I was able to pick enough off to grab a handfull. It shreds up as I remove it, and I toss it in the garbage. The second one comes off in one big sheet until I’m about halfway down when it goes *pop! * and to my astonishment it peels a chunk of clearcoat, along with a layer of paint right off the car! I stared in disbelief at the sticker, now shredded and hanging halfway off the car and held up by my limp hands. I wanted to cry. I gathered my wits and gingerly pulled it the rest of the way off without further injury. I wandered around in a daze for a while… trying to think of what to do. I went inside, tried to collect myself, and wrote a note to the E-type mailing list to see what the collective mind suggested. I got some good advice (as always) and even some leads on good paint guys nearby (Thanks Roger! )… we’ll see how it turns out. You can see the full set of damage photos here. As you can see, 13 is NOT my lucky number! Author chuck goolsbeePosted on October 13, 2006 October 13, 2006 Categories 06 GTTSR, Cars, life2 Comments on Luck, or lack thereof. Above: Brian Medley and myself arrive in Monroe, WA, where Brian’s wife picked him up. The final day, September 11, 206 we woke up in Kalispell, Montana, and went to sleep in our own beds. Me in Arlington, WA, Brian in Sammamish, WA, and my Dad in Colorado. Mom & Dad drove their truck from Big Sky to their plave in Vail, while Brian & I left Montana, went through Idaho, and Washington along US Highway 2. A great road. I woke up a couple of hours ahead of Brian and worked on some photo edits and website work while he slept. Once he woke up, we hit the road almost immediately. We decided to have breakfast in Libby, Montana, where I’d had lunch with the rally a few days before. 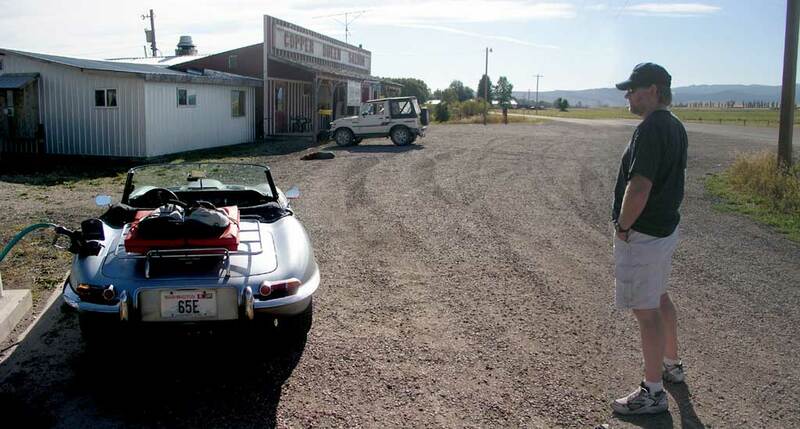 We arrived in Libby, at breakfast at a small cafe, bought 3 quarts of Castrol for the Jaguar (which promptly drank two quarts), and motored west through Idaho, with Brian at the wheel. Brian drove from Libby to just west of Spokane, with me catching a nap here and there, and occasionally shooting wrap-around composite photos, which I’m sure drove Brian nuts. You will note there is something unusually similar about these two pictures. 😉 My only issue with Brian was that he drove too slow, but hey, I’m sure he was just being conscientious since this was a nice car, and this section of the drive was perhaps the most densely populated. Brian lived in Spokane for several years so knew a shortcut around the main part of the town. Highway 2 goes right through the middle of the city with a “Aurora Avenue” style string of traffic lights, so we bypassed downtown Spokane via a route around the northwest quadrant of the city and arrived back on US 2 out near the airport. We gassed up and switched drivers and I thoroughly enjoyed the run west on US 2 through central Washington. I had never driven this section of US 2 and was surprised at both the quality of the road surface and the scarcity of traffic! After I was able to work my way to the front of a pack of cars stuck behind a few slow moving vehicles, I put the hammer down and had the 65E chewing up miles like nobody’s business. The only time I dropped to the limit was approaching towns where the limit dropped to 25 MPH or so. But once out of the town and into the open road, back went the speedo to familiar territory in the upper reaches. A ways into this, I looked in my rear view and saw a black car approaching very fast. I asked Brian to keep an eye on it. When it got within a quarter mile or so I took advantage of the reverse slope of a hill to brake hard and drop us down to just above the speed limit and let the fast approaching car reveal itself. Turns out it was just a Dodge Neon with somebody in a big hurry at the wheel. They passed us and I waited until they got about a quarter mile ahead and matched their speed. A rabbit! I love that. With a good detector it is the best possible situation for high-speed runs. They take point and most of the risk, and you can run like the wind. After a bit of this my rabbit either figured out what I was doing, or lost their nerve, and slowed to 75-80 MPH. In turn I rode up behind them but did not pass. Hoping to psych them into taking off again. No dice… or at least so I thought, when a County Cop crested the hill ahead of us, radar off. Both us braked instantly down to the limit, and it is obvious that this sighting set off the “D’oh!” alarm in the Sheriff’s head. Within seconds after passing us my detector announced that he’d turned on his radar. Too late to tag us, but I also knew that he continued east, and did not turn around. The sighting did spook my rabbit however, and they completely lost courage. Emboldened by my Valentine I happily passed the Neon and took the rabbit position and once again revved the XK up to “ludicrous speed.” The road was gloriously empty, with only the occasional town to slow us to a limit. Through the Coulee and Pothole country and shortly to the Great River Of The West itself. On the downhill grade to the Columbia we ran into some traffic and managed to make some passes that left the Neon far behind. The time between Spokane and Wenatchee seemed to fly by. We stopped for a late lunch in Leavenworth. We had burgers at Gustav’s, a great place. It was a nice leisurely lunch after a hard driving day. Only the short hop over Steven’s Pass awaited us. We both called home and informed them of our proximity. Brian arranged a pickup in Monroe, a few miles from US 2’s terminus in Everett. Monroe was a perfect departure point as it was at the edge of Pugetopolis, and easy acces to both Sammamish and Arlington. Especially goodfor me as I can take little-used back roads north from Monroe through the foothills to Arlington. I took the wheel for the sprint over the pass, and enjoyable run up Tumwater Canyon, then up to the ski area at the summit, then plunging down to the Skykomish river and out of the mountains and to Monroe. We met Brian’s wife at the Burger King along US 2, said our goodbye’s, and I topped up the 65E’s tank with some high-octane fuel (it was still knocking from that tankful of 87 octane in Helmville, MT) and ran up my usual “back way” to Arlington and home. Above: The 65E cooling down in my driveway after the long hard week of running all over the Northwest. What a great week. What a wonderful vacation! My Dad, for getting me hooked on cars, and being my co-driver for this event. Jim Sitton, Farnum Alston and the whole GTTSR crew for putting on a rally in the great state of Montana! Close enough to drive too, far enough away to be a real vacation! Brian Medley, for taking the time to come along. A great travelling companion. Most of all to my wife and family for letting me go. 9/9/06 was my 18th wedding anniversary, and I was absent, out having fun in my old car. 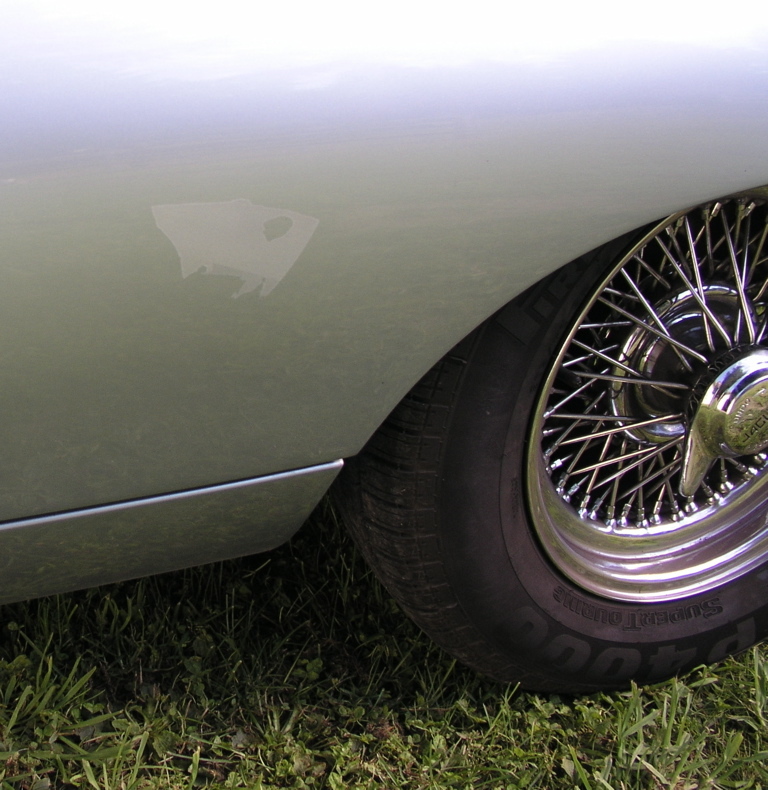 I’ve always wanted a vintage car rally to happen in the northwest. 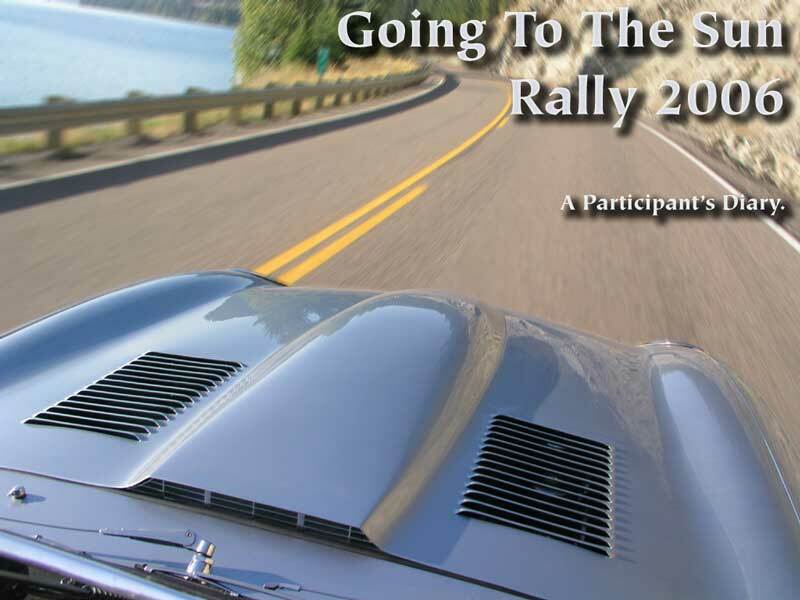 In 2004 I heard about the inaugural run of the Going To The Sun Rally in Montana, and I signed up that day. Finally here was a rally that wouldn’t involve jet lag or towing. I could drive to it. 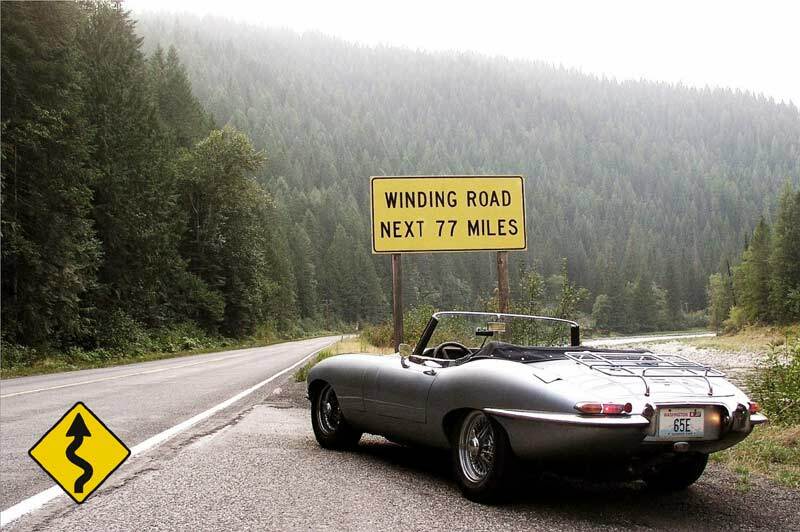 Add to that Montana, one of the last true open road places in America. Sign me up. I was all ready to go, but unfortunately the car wasn’t. The 65E’s engine was knocking, due to improperly installed wrist pin bushings by the car’s original restorer and I spent the summer of 2005 getting the engine sorted out and having a less-than-satisfactory discussion with the car’s original restorer, who it turned out had completely botched the restoration! By late September the Jaguar was back together again and running well through its break-in period, but we had missed the GTTSR 2005. As a “Miss Congeniality” prize, I was able to attend the 2005 Colorado Grand as a co-driver in my parent’s 300sl. I had a GREAT time, but I missed the inaugural run of the GTTSR. Thankfully I was able to provide a few-month’s warning to the GTTSR’s organizers, and they were able to find somebody to fill our vacancy. I vowed that the second year would not pass me by, and signed up early for the 2006 GTTSR. I filled in all the paperwork and sat anxiously by the computer awaiting my acceptance in the rally. It arrived in early March… we were in! By now, the car was all broken in and running well. So I planned on driving it to and from the rally as a nice book-end to the event. Arlington, WA to Red Lodge, MT is a hard single day, or two easy days worth of driving. My father, who signed on as co-driver informed me that he would assist in driving the car out, and I called a professional acquaintance, Brian Medley, who I knew as a serious gear-head (whenever we met in the context of our jobs the conversation worked its way to cars) so I know he’d be interested. Sure enough, he agreed. The plans were set, the time crept slowly through the summer. The week before the rally I brought the car up to Canada to my trusty engine builder Geoff Pickard of English Classic Cars for one last look-see, and the car came out of it transformed! Running better than ever, we packed it up and headed east. As I have been doing since 1998, I have brought along a camera and updated my website every night along the way with words and pictures. This allows my “regular readers” to follow along in near real-time as the event occurs, and then allows for a historical record of the event after it is done. Official Rally Day Five: Helena to Red Lodge, Rally Done! If you prefer “blog style” backwards chronology, just use this link. Feel free to login and provide comment on any section, photograph, etc. If I’ve misspelled somebody’s name or car, let me know. Above: Brian watches the only gas pump in this whole valley drain his wallet into the E-type. We woke up this morning to a great breakfast, and all the rally members scattering to the four winds. My wind was west-northwest. I took Dad back to Bozeman, and dropped him off with my Mom. Then I went to the Bozeman Airport and picked up my friend Brian Medley off the flight from Seattle and we pointed our noses home. 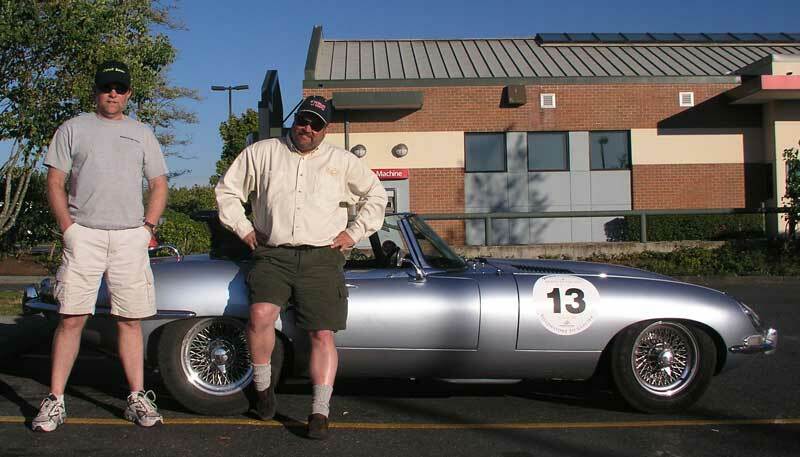 I asked Brian to come along as my co-driver to get the Jag home, mostly because it would be good not to go alone, but also because Brian is a total gearhead and would love it. We left Bozeman going west on I-90, but left the Interstate as soon as posssible and headed for Helena on US 287. In Helena we searched for the malt place Bill Woodcock told me about, but found it closed on Sunday. We instead grabbed a fish taco for Brian’s lunch and hit the road west on US 12. After crossing the Continental Divide we got onto some smaller Montana state highways and followed some gorgeous valleys in a northwesterly direction. Our goal was to get to US 2, and take that west. Our short-term goal was to get to Libby for the night, but we only made Kalispell. Many mini-adventures happened today, including, navigating Helena, a near-dead appearing vicious dog, the only gas pump for miles around, a fire, a fire camp, some deer on the road, and the world’s most bizarre bicycle. Top it off with navigating Kalispell and a great dinner. Tomorrow should see us home in the Puget Sound region if all goes well.